As discussed in the EasyAsk white paper Increasing Customer Conversion by Boosting Product Findability, customer eyes are always drawn to special display areas ion the browser, making them a fantastic way to promote products and drive more sales. Many sites will have often used special display blocks such as “Related Items” for cross-sell promotions or “You Might Also Like” for up-sell promotions. This capability is typically built into the e-commerce platform merchandising/promotion screen. These promotions are easy to enable in your e-commerce platform, but are extremely difficult to manage there. Why? E-commerce platforms will force you to hard-wire cross-sell and up-sell relationships on a per item level. When your site reaches hundreds of items or more, this process becomes time-consuming, unwieldy and costly. Dynamic, natural language merchandising rules and an easy-to-use merchandising tool alleviate this merchandising problem and give greater flexibility for promotions and offers. The dynamic rules execute on the fly based on what the visitor is searching on, clicking on or looking at, determining the best products to place in the block(s) and increasing the click-through and conversion rates. Let’s take a look at Travers Tool’s e-commerce site. They use dynamic natural language rules, executed in real-time to fill into two special blocks on a product page: Optional Items and Recommended Items. The first image is the top of the product page for a Craftsman Bench Grinder, and the second image shows the two special blocks lower on the page. The Travers Tool site used a natural language rule to (a) understand the page is for a Craftsman Bench Grinder, and (b) relate in real time the optional products and recommended items. Since the relationship is derived in real-time based on attributes, merchandisers do not need to hard-wire the relationships within each product entry in the product catalog. This is a tremendous time saver for the merchandisers and reduces the cost to maintain the product catalog. We announced the global release of the EasyAsk Magento Connector this morning. The EasyAsk Magento Connector enables rapid implementation and direct integration of EasyAsk natural language search, navigation and merchandising for Magento E-Commerce sites. Is integrated directly with the Magento product catalog and attributes, enabling using long-tail natural language searches, even those from voice input on a mobile device. Seamlessly integrates into the Magento site display with no API programming for rapid implementation and easy change. A dynamic navigation plug-in that supports the selection of multiple attributes for faster navigation to products by visitors. Support for “derived attributes” that allow you to create new categories and attributes from existing Magento attributes without the time and cost of restructuring your Magento catalog. Ties the easy to use EasyAsk merchandising studio to the Magento catalog and attributes for fast, easy natural language promotion rules. Supports full internationalization and localization supporting Magento sites sites in different languages and countries including English, German, French, Dutch, Italian, Spanish & Portuguese. Dozens of Magento-based sites are using EasyAsk for Magento including some of the largest Magento sites such as The North Face EMEA, Harbor Freight Tools, Watsco and Anna’s Linens. As we announced last week, the North Face EMEA deployed EasyAsk across 11 sites across 9 different countries, seeing a 35% increase in search conversion rates and a 24% increase in revenue from search. The EasyAsk Magento Connector is available for free to customers using the Magento e-commerce platform. EasyAsk for Magento delivers superior natural language search, navigation and merchandising for Magento customers that dramatically increases conversion and revenue over the embedded Solr search. Burlington, MA – March 25, 2014 – EasyAsk, the leader in natural language software and solutions, today announced the global availability of the EasyAsk Magento Connector which seamlessly integrates EasyAsk eCommerce search, navigation and merchandising with Magento’s e-commerce platform. Customers worldwide have deployed EasyAsk for Magento enabling significant increases in ecommerce revenue, customer conversion, business efficiency improvements and reduced costs. Some of the largest and most successful Magento customers are using EasyAsk for Magento, including The North Face EMEA, Harbor Freight Tools, Watsco and Anna’s Linens. The North Face EMEA deployed EasyAsk across 11 sites across 9 different countries, seeing a 35% increase in search conversion rates and a 24% increase in revenue from search. Natural language search integrated directly with the Magento product catalog and attributes, allowing customers to find products faster using long-tail, descriptive searches or even voice input from a mobile device. Seamless integration into the Magento site display with no API programming for rapid implementation and easy change. Support for “derived attributes” that allow you to create new categories and attributes from existing product information without the time and cost of restructuring your Magento catalog. An easy to use merchandising studio that allows merchandisers to define and rollout promotions as well as make changes to the search experience without IT support, speeding time to market and reducing IT costs. In addition, EasyAsk enhances the performance of Magento sites through high-speed indexing and more efficient servers, delivering a better customer experience while reducing costs. By offloading the search and navigation load to EasyAsk, customers report seeing a marked improvement in the performance of their Magento sites. EasyAsk will be demonstrating this functionality at the Internet Retailing Expo in Birmingham (Stand A37), United Kingdom on March 26 and 27, 2014. EasyAsk is radically changing the speed and ease of how people find information through ground-breaking Natural Language search software. EasyAsk software products go far beyond traditional search, allowing users to simply ask questions in plain English and receive highly tuned results. Based in Burlington, Massachusetts, with offices in Europe, EasyAsk has long been a leader in natural language information analysis and delivery software. Customers such as The North Face, Coldwater Creek, Lillian Vernon, Aramark, True Value, Journey’s, Anna’s Linens and Harbor Freight Tools rely on the EasyAsk software products to run their business and eCommerce operations daily. For further information please visit www.easyask.com. EasyAsk will proudly be exhibiting at the Internet Retailing Expo 2014 in Birmingham, United Kingdom on March 26th and 27th. Come talk to us, see our latest customer stories and watch compelling demonstrations at Stand #A37, just across from the Magento booth. We look forward to seeing you at the event. Since “find” is the first stage in the purchase process, understanding how customers find products on your e-commerce site and adjusting the site to match their needs is the most essential element to improving the purchase process. This will increase your customer conversation rate, generate larger order sizes, drive more revenue and increase customer satisfaction. To improve your “product findability” you must put yourself in your customers’ shoes and understand how they behave on your site. You can then take this knowledge to tune your site to work effectively with this customer behavior and improvove your conversion rate. This white paper will explore five common customer behavior patterns that e-commerce sites often ignore or do not handle effectively. And it will show you ways to improve your site to handle these cases and convert move customers in the process. When a customer performs a search or navigates to a category, the most important thing is to get the right products to the top of the page. But what defines the right products? They could be the combination of products that most accurately match the search and products you want to promote at this time which fall within the search parameters. “Relevancy” is the most important feature in a search engine for accuracy. EasyAsk’s natural language engine delivers far more accurate relevancy scoring through features such as phrase matching, column weighting/ranking and value-based relevancy to expand control over results and deliver better hit rates. Read more on our earlier blog post on relevancy. Product Age –promote older products to clear out the remaining inventory or promote newer products that might be more in season. The results and category pages need to be driven by promotion rules that can take into account these different factors. This is where natural language rules come into play. It allows the merchandisers to specify the priority of the products in the display in their own language. These rules also allow merchandisers to create “derived attributes” that create customer friendly ways to display and categorize products without the time and cost to re-design the attributes in your product catalog. EasyAsk customer Andertons Music took advantage of natural language rules to better promote products on their e-commerce site (read the press release). Promoting the most effective products is the third customer behavior use case in our new white paper: Increasing Customer Conversion through Better Product Findability. You can download this free paper and find ways to better tune your site to customer behavior. We were pleased to announce this morning as part of our continued partnership with The North Face® that The North Face Europe has rolled out EasyAsk eCommerce Edition for Magento on 11 different sites across Europe. This rollout delivers the customer conversion power of EasyAsk’s natural language search, navigation and merchandising to each of these sites. The North Face Europe has already seen fantastic business results from this rollout – a 35% increase in search conversion rates and a 24% increase in revenue from search. EasyAsk was deployed in 9 different countries and the accompanying languages including: UK, Germany, Netherlands, Sweden, France, Italy, Spain and Austria. 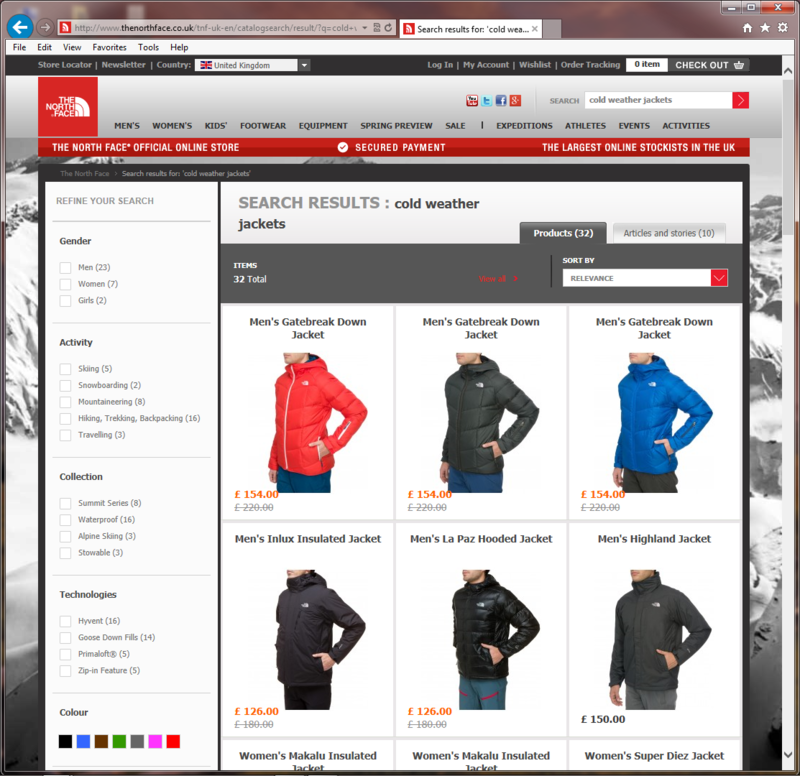 The North Face had already deployed EasyAsk eCommerce Edition in the United States and Canada. 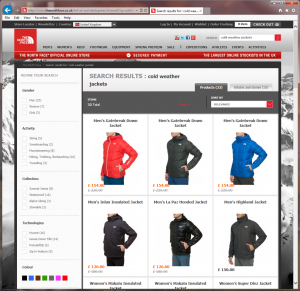 The internationalization and localization features of EasyAsk truly shine in the rollout at The North Face Europe. We offer many thanks to the team at The North Face Europe for allowing us to share this great news with our community. Leading Outdoor brand The North Face, a Division of VF Outdoor Inc. deploys EasyAsk eCommerce Edition across key European business units to deliver enhanced site search and navigation, seeing a 35% increase in search conversion rates and a 24% increase in revenue from search. The North Face EMEA have deployed EasyAsk to deliver advanced site search across 11 sites supporting key European markets to help their customers find the products they are looking for quickly and easily across multiple channels. Visitors can now utilize EasyAsk’s unique natural language and voice capabilities to specify what they are looking for in their local language to deliver a far more effective search experience than is possible with traditional keyword search. LONDON, UNITED KINGDOM and BURLINGTON, MA, USA – March 12, 2014 – EasyAsk (www.easyask.com) today announced that The North Face has deployed EasyAsk’s comprehensive advanced site search, delivering for their customers a vastly improved user experience, allowing customers to quickly find the product or content they are looking for to complete their purchases, whilst leveraging The North Face’s existing Magento ecommerce platform. Following the success of the EasyAsk roll out in the USA and Canada, The North Face EMEA have deployed EasyAsk to support their business units across 9 countries including the UK, Germany, Netherlands, Sweden, France, Italy, Spain & Austria taking full advantage of EasyAsk’s support for local languages, whilst further leveraging the investment made in their existing ecommerce systems. The North Face, a division of VF Outdoor, Inc., is the world’s leading outdoor brand. Headquartered in Alameda, California, The North Face creates and distributes athlete-tested, expedition proven products that help people explore the world and test the limits of human potential. The North Face products are guaranteed for life and available in specialty mountaineering, backpacking, running, and snowsport retailers, premium-sporting goods retailers and major outdoor specialty retail chains around the world. For more information on The North Face, please visit www.thenorthface.com. Once upon a time the search box was a mundane rectangle sitting in the upper part of an e-commerce site. It served a purpose and sites that recognized the need for good e-commerce search enabled their customers to find what they were looking for. Simple features such as auto-complete and search suggestions helped guide visitors in their search process. EasyAsk Search-as-you-Type (SayT) takes the e-commerce search box to a whole new level, transforming your search box into a “sales box.” SayT goes far beyond auto-complete and suggestions, allowing visitors to navigate a large and complex range of products directly within the search box. SayT provides optimized suggestions for products, categories, navigational attributes and content as the visitor types. With the click of a single item in the SayT list, the customer is whisked to the product they are looking for. SayT converts visitors into buyers quickly and easily. SayT was one of the main reasons Andertons Music selected EasyAsk for its’ e-commerce search, navigation and merchandising needs, and helped the company deliver record growth last year. Watch this short video to learn more about the revolutionary Search-as-you-Type capability for e-commerce search and see how it can transform the customer experience on your e-commerce site. Auto-complete and search suggestions were interesting add-ons to help enhance your e-commerce search box. But Search-as-you-Type (SayT) completely revolutionizes how your search box works and turns it into a “sales box” that converts visitors into customers so fast, it will make your head spin. Watch this short video (1 minute) to see how Search-as-you-Type delivers this customer conversion machine to your e-commerce sites.